Bramfield's church of St.Andrew with its distinctive and unique freestanding round tower from which the previous photographs were taken. There is no evidence that any other building has ever been attached to the tower. The tower measures 43'6"/14 metres high with correspondingly thick walls wherein are housed five bells of varying dates from 1440. 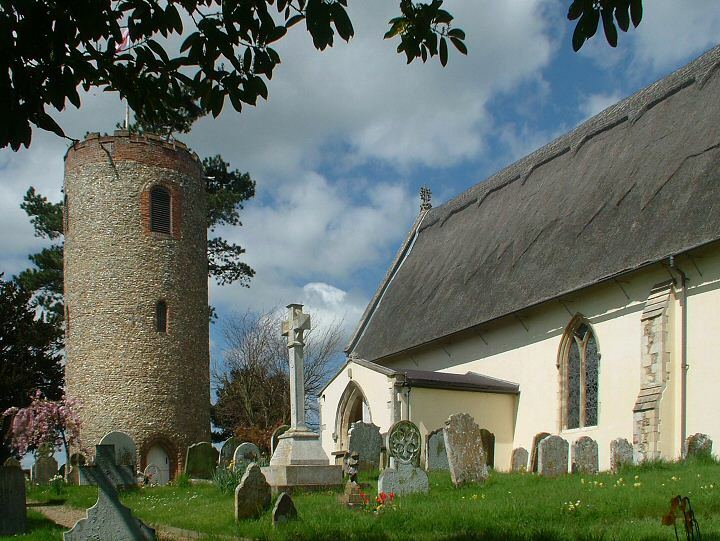 Round tower churches are a feature of East Anglia with 42 in Suffolk, several of which are within a few miles of Bramfield. The main church of St.Andrew's is a beautiful building inside and out with notable memorial sculpture, interesting memorial inscriptions and a fine early 16th century timber screen which still features colour decoration.